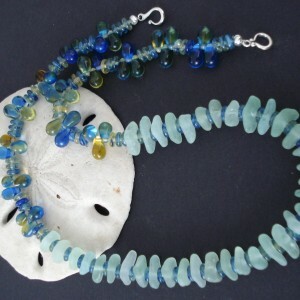 I think sea glass jewelry is a lovely way to recycle sea glass and bring the ocean to the wearer. As the world becomes more and more crowded and complicated, we need to think more about recycling and repurposing things in our world instead of just throwing things in the trash. 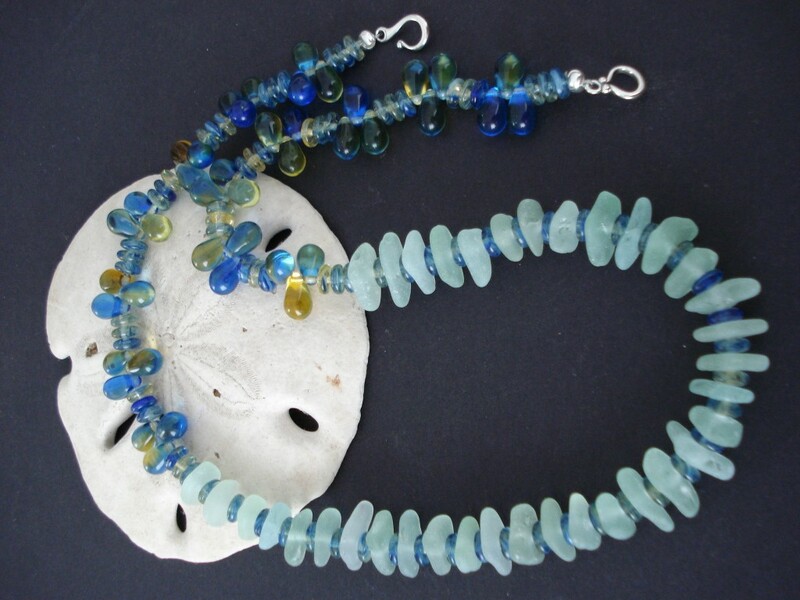 Sea glass jewelry is reclaimed glass from the sea. I am a voracious reader and writer. I used to write children's books for kids who have trouble reading, now I write a blog about our sea glass and art festivals. I love standard poodles. Tahiti is one of my favorite places to visit. I love the beach, but I live in the desert - Palm Springs. As a Pisces, I'm drawn to all places with water - even swimming pools. I believe in recycling and I'm committed to keeping the oceans and beaches clean for now and future generations. 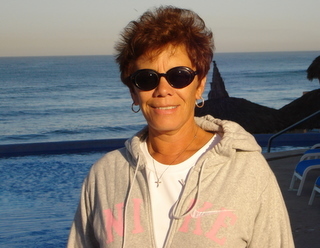 A few years ago, I moved to Palm Springs in California. Every once in awhile, I needed to get out of the desert and go to the beach so I started going on vacations to Mazatlan with my sister Shirley, who lives in Medford, Oregon. Both of us love to walk the beach and collect shells and sea glass. One night, we were sitting around and admiring our sea glass finds and both of us thought the glass looked like jewels. The conversation continued and Shirley, who had been an art major in college, said, "why don't we make sea glass jewelry." It has been three years, a lot of learning about jewelry making - wire wrapping, drilling sea glass, etc., and our company was born. At first, we were just drilling glass and making necklaces and earrings with beads and crystals, then we expanded to wire wrapping and crocheting with sea glass and wire. We're still learning and hope to soon master the art of bezel settings. It's an on going adventure and it definitely gets me out of the desert. The sea glass pieces are my source of inspiration. The color, size, and shape determine what I will make out of the sea glass. For example, earrings are difficult because I have to go through my sea glass collection and find say two pieces of green sea glass that are approximately the same size and shape - not an easy proposition as really no two pieces of sea glass are exactly alike. If I find I have a lot of tiny sea glass pieces of the same color and size I might make a sea glass necklace - so really the sea glass is my inspiration. I recently made the sea glass necklace in the picture above. 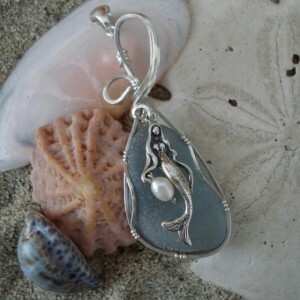 I love sea foam green sea glass as it is not a common color and it so reminds me of the ocean. I had been collecting the tiny pieces for several years. I had to drill all the tiny pieces and then find some crystal beads that would offset the gorgeous green of the glass. I strung the sea glass and beads and added a clasp. I think the necklace is delicate and timeless in its appeal like a string of pearls. We started selling our sea glass jewelry at home parties, then we expanded to art shows and art festivals. We still do the summer art festivals and now we've been invited to show our work in a store in Carmel, California and an art gallery in Medford, Oregon. We recently created a website and I'm continually looking at ways to market the website - quite a lot of work. And we want to get our jewelry into more stores and galleries. I love handmade jewelry because it is so unique. 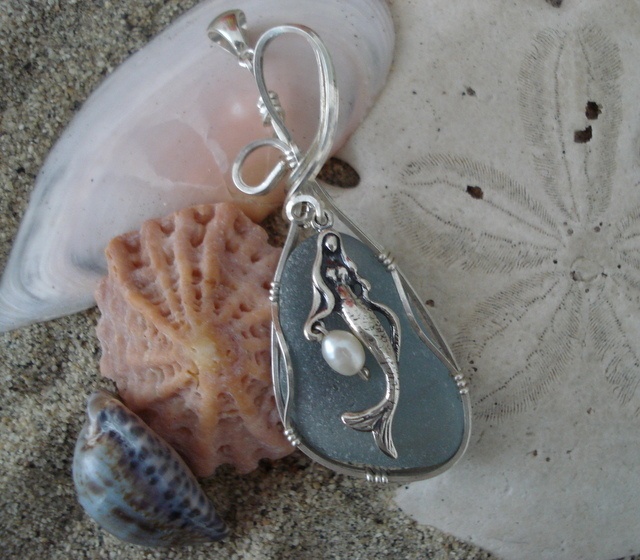 And because sea glass is so one of a kind it lends itself to handmade jewelry pieces. Handmade jewelry is special to me because it comes from that creative part of the self that lies awake at night imagining what something could be. Then to see the piece become a reality is very exciting. it's like giving a little piece of oneself to the world. Making jewelry by hand is so very satisfying. It makes me happy and I hope it makes the wearer happy too.